Latest Norstat poll for Altinget shows a tie between the red and the blue blocks. 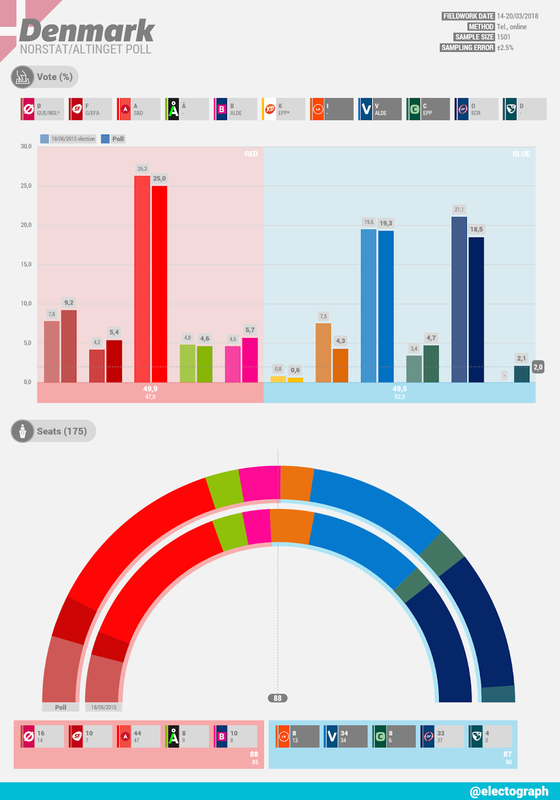 The Social Democratic Party is on 25%, which is 6 pp lower than last January. On the other hand, liberal Venstre and right-wing Danish People's Party make gains compared with the previous poll. All in all, the red block would have a minimum advantage with 88 seats against blue block's 87. La última encuesta de Norstat para Altinget arroja un empate entre los bloques rojo y azul. El Partido Socialdemócrata obtiene un 25%, 6 puntos menos que en enero. Por otro lado, el liberal Venstre y el derechista Partido Popular Danés crecen respecto a la anterior encuesta. Con todo, el bloque rojo tendría una mínima ventaja con 88 escaños frente a los 87 del bloque azul.